Reader “SJaffe” writes to us, “Hi, Dr. Randolph, I foster a Cocker spaniel who is 12 years old. She is heartworm-positive and it’s just breaking my heart. I would love to do everything I possibly can do help her get through this. She doesn’t really have a cough but she breathes very, very deeply (with a wheeze) mostly at night and after getting excited. It seems that her abdomen might be swollen (based on what I’ve read online). She is on her heartworm preventative. Basically, my question in I’m thinking about adopting her. I don’t know how much financially this will hurt me or even if she is suffering right now. Do you have any advice as to alternative treatments/anything? There is a lot going on here, SJaffe, so let’s go step by step. 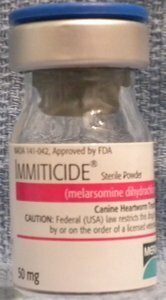 It’s good that she’s on heartworm preventive (readers need to understand that there is a medical protocol for beginning heartworm preventive for heartworm-positive dogs which must occur under careful medical guidance. Do not attempt this at home.) That will keep her from getting more heartworms. There are many conditions that can cause deep breathing and wheezing. It may or may not be related to her heartworm status. Your veterinarian’s physical examination and chest X-ray will help to determine why this is happening. Caval Syndrome, a complicated process in heartworm disease. In either of these cases a veterinarian’s intervention is needed. Only your local doctor can advise you regarding cost. 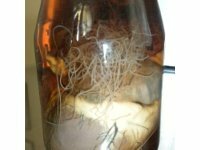 Beware of “alternative treatments.” Study after study proves that heartworm-infested dogs experience significantly more damage to the lungs and circulation when non-traditional treatments are used. In other words, your veterinarian is going to have to perform an examination and some tests in order to answer your questions. We do hope you will keep us up to date about his findings and her progress. Thanks, RumpyDog, I hope so, too. I’ve asked her to keep us updated. We’re glad you enjoyed your visit and you may wish to read more from our Heartworm Category List.